UMW Toyota Motor (UMWT) has announced an updated Toyota Vios for 2018, which the company says gives customers even better value for money. There are cosmetic changes inside and out, as well as new equipment. New to the kit list are front parking sensors, shark fin antenna and illuminated scuff plates. UMWT says that the Vios will be the first model in its segment to feature front parking sensors, which will be standard on TRD Sportivo, GX and G variants. A new DVD-AVX entertainment system with enhanced features is also available – it’s linked to a reverse camera on all variants except the Vios J MT and AT. These are all in addition to the running changes announced in May 2017. If the images show a different looking Vios, you’re right, there’s a new and more busy aerokit for the B-segment sedan, shown on the red and silver car here. The rear section of the kit is also fresh, now with a honeycomb insert and diffuser fins. The bodykit for the TRD Sportivo (white car) has been carried over, but looks fresh with a red lip on the centre section. The range topper’s rear also has a matching red strip; while the wing mirrors, shark fin antenna and rear spoiler have been painted black. There are also red accents on the wheel centre caps and a new sticker on the side skirts. As before, there are six variants of the Vios in Malaysia, and prices range from RM74,980 for the 1.5J manual, rising to RM77,980 for the 1.5J auto, RM81,980 for the 1.5E auto, RM87,980 for the 1.5G auto, RM90,980 for the 1.5GX auto and RM93,980 for the 1.5 TRD Sportivo auto. All prices are on-the-road without insurance, and as usual for UMWT cars, the Vios comes with a five-year, unlimited-mileage warranty. Body kit cannot sell or what??? the rear fog lamps is part of new ECE requirement made mandatory by ministry of transport beginning 2017. Tak pikir tu jadi pening nanti. Lebih baik beli P1. They can solve this issue by using the same switch used by Merc, bmw, vw; rotary-type switch. Have to pull the switch to on the fog lamps. Not like Toyota, proton, perodua; a simple push button. Oh, rear fog lamps can be annoying, how about front fog lamps? Org malaysia pantang ada lampu, misti mau bukak. 3. non rusting bolts for rim. 5. premium wiring for electronic devices. 6. Air tight digital dials area. 7. A++ hard environment unfriendly plastics . OKlah… it’s a good car. Really.. it’s good. The AVN is made in China for China market. How i know? The dials r on the left side. No safety on recycled chassis and FC worse than b4 cuz need to tekan more for it to go. Lagi vios lagi facelift. Facelifting since 2002. Toyota ASEAN shud kolos shop according to basher logic. Boss…. where got face-lift since 2002? Same chassis and up to keli 1st FL, same engine and gearbox. Only different body. Just like plastik surgery. So its like facelifting since beginning in 2002, no? john, jangan kelantong. Engine dah upgrade tahun 2016 to 2NR-FE 1.5 Dual VVT-i dengan CVT. Unless U are STILL living in 2015 !!? Bukak mata baca betul2 komen sy. Dah cakap tukar masa facelift lalu, tapi dari 2002 hingga 2016 pakai apa engine & GB ye? So siapa kelentong skarang tu? Same engine and same gearbox since 2018? you kidding bro? As far as i know, the vios 2018 is using dual vvt-i and yes it is not the new engine but for sure it is not since 2002. CVT 7 speed with +-switch available at this vios, not the new also but for sure it is not since 2002.
conclusion: there is no people will blame a brainless people but please at lease get some think and research before post. thanks. What the f….. the Myvi had front sensors long time ago liao. They need to stick in 4 extra airbags to be on part with the rest la…. hahaha.. UMW like to make joke & syok sendiri nothing special with front parking sensor.. we still can park properly without those annoying sensor..
More bling bling from UMW to entice customers. When are they going to learn? The myvi already have it since previous model, proton persona also have it no? “in its segment”, Vios is B-segment sedan. Myvi is B-segment hatchback. Do know that vios is a taxi on other country. Malaysian treat it like its a Lexus…LoL! Some ahbeng vios even stick Lexus badges on the car. lol! Shut up UMW, bring the Vios ATIV. Bodykit after bodykit after bodykit..
W O W !! I T U S H A R K F I N A N T E N N A S Y M A U !!!!! T Q U M W T !! New bodykit , and more kit … and more kit … and more kit ……..
Old chassis , old technology on engine and gearbox , old structure …. UMW helping Toyota regional clear Vios old stock. Slap on some bodykit & call it “updated 2018 Vios”. Nak untung lebih, beli old stock murah², jual mahal². Untung babe. Gelak sehingga bank (Laughing to the bank). Pro tip to UMW. Throw in a usb loaded with Hokkien of Canto Greatest Hits. Sure Beng will booking immediately. Toyota shud change T badge to Lexus badge. Sure will sell 20k per month. 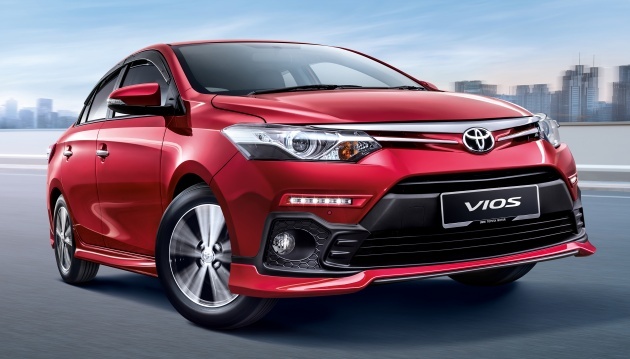 How many time they updates the current VIOS still look ugly compared to CITY. I’ve lost count their updates of the cars. Why not tie a red ribbon around it and call it an update? Yes la Shark fin antenna , no more pasang-sendiri !! Why la UMW Toyota? Why are you guys so stubborn and behaving like a bunch of LOSERS? Wake up and offer more new offerings from Toyota Japan. The models to look at for our demanding market is the Auris, Spade New Liteace(mini Alphard), Hybrid models etc. The real Toyota have so many models to be competitive and they are the top car producers in the world for a reason. But UMW is making Toyota a bad name in Malaysia! Previous Post: Volvo XC60 2018 – harga dari RM330k hingga RM380k?